It is official! Helen Maier and I now own a publishing house! 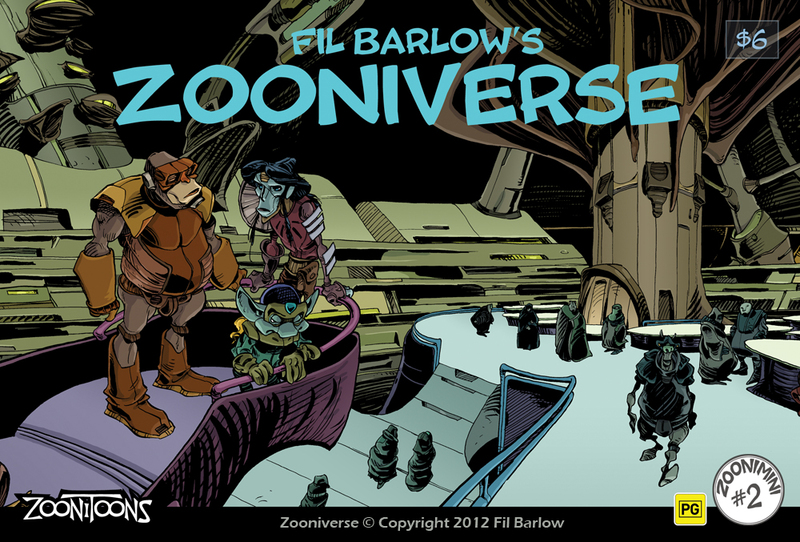 We took the plunge through our new Australian company Zoonitoons, printing two comics:- Zooniverse mini #2 and a reprint of issue #1. Launching them at the Armageddon Comic Expo in Melbourne. Halfway through Saturday we recovered our printing costs. We are sincerely grateful to everyone who supported us by buying copies! 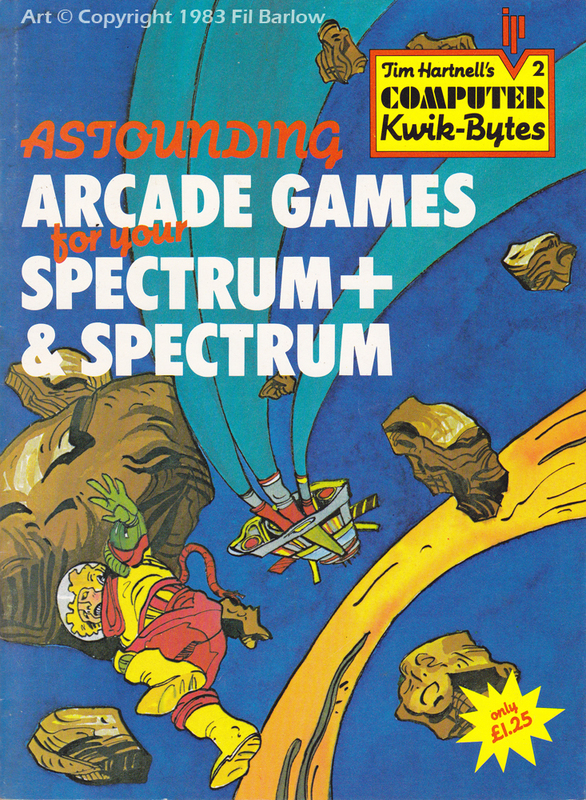 This issue collects some my pre-Zooniverse comics published in Melbourne around 1983-84 and nine illustrations I did for the UK at the same time. All of the artwork in this issue was rescued last June after 15 years mouldering in a Queensland garage. Back in our possession we were shocked to discover the poor condition of what remains. Luckily we found a few old bromide copies and although most of the out-of-print mint copies I had of Australian comics containing my work were nicked a decade ago by our light-fingered ex-employees, a couple of original comic magazines survived. It was important to get this work scanned and printed before the originals deteriorated further, becoming unusable. 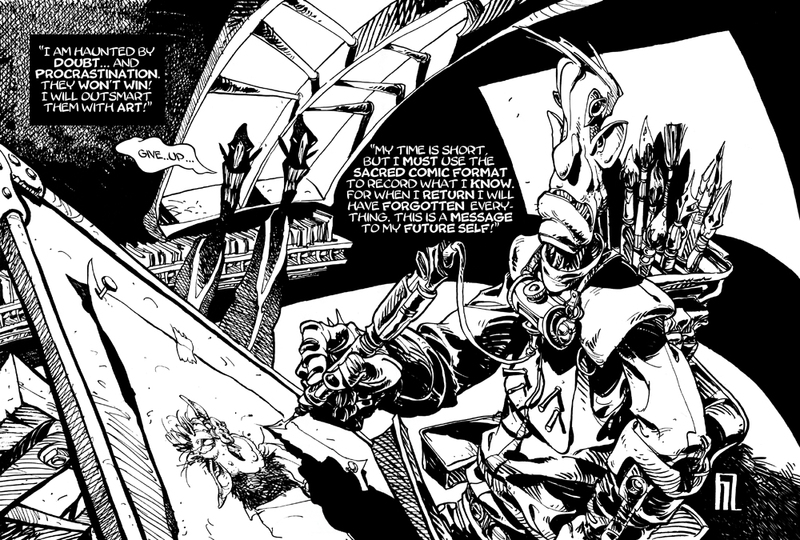 Please keep in mind that all the line art was done before computers, using brushes and metal nibs dipped in ink bottles! The cover for Zoonimini #2 is a huge coup to finally have this art printed after waiting almost three decades. It was originally done, when I was 21 years old, as a wrap-around cover for Inkspots issue #5 back in 1984 (the year Helen and I met). 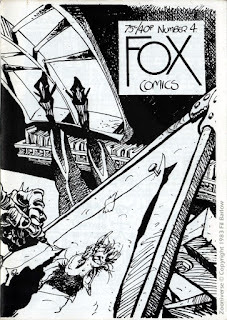 Unfortunately the comic magazine was abandoned by it's publisher and the original art was either lost or stolen. All that was left to work with was a single twenty eight year old bromide. I was so happy to finally scan it and digitally colored it! Seeing as we were getting posters printed we have an A3 version that will be available for purchase on the Zoonitoons' website. The poster includes the 3 zoons that were cropped out so that the Kren Patrol could be featured on the above cover. 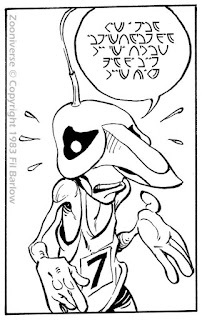 The stories inside Zoonimini #2 include "Sproat Fanbunder & Spleen Sphincter: the infamous repairmen" which was originally printed as a two parter in Reverie comic magazine issues #6 in 1983 and #7 in 1984 (I did the second installment while working on the original Zooniverse series). Below is the front page for the story, the original art was never returned from the printer, so I assume that puts it in the stolen category. 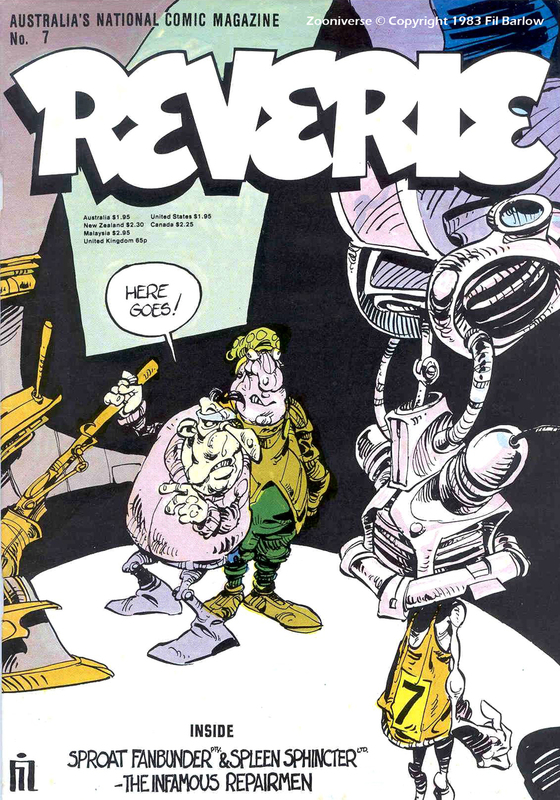 Below is the cover for issue #7 as it was printed in 1984. I had to do the colors by hand separation, which meant a separate piece of art for each CMYK color, it was tricky to guess the right combination of values to make a subtle color. 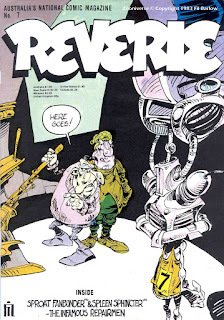 I no longer have this original art or my mint copies of Reverie, so I relied on the help of fellow veteran cartoonist Ian Thomas to send me a scan of the cover which I repaired as shown above. Without Ian's gracious help this art would have been lost forever. 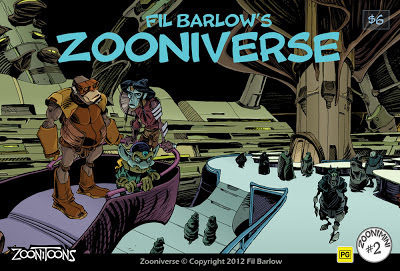 The story for the infamous repairmen on the surface seems to be a flippant and shameless plug I did back then for the upcoming Zooniverse comic, but it is actually deeply personal allegory for my childhood. With Spleen representing my father, Sproat my mother, Snok as me and the Clone-a-gram as my art (Zooniverse). My two younger brothers don't make an appearance but they were essentially treated the same as me, so Snok could easily represent them too. I'll leave you to figure out the rest should you get your hands on this story. 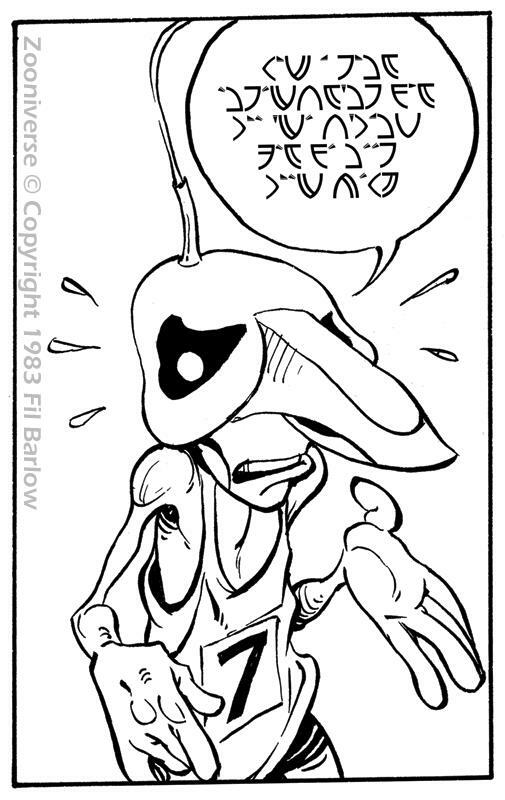 The second story in Zoonimini #2 is "Sacred Stripture". For this one I set myself a ludicrous challenge. I wanted to combine old illustrations with my recent "History" animation so that the story looped between the comic and the animation. 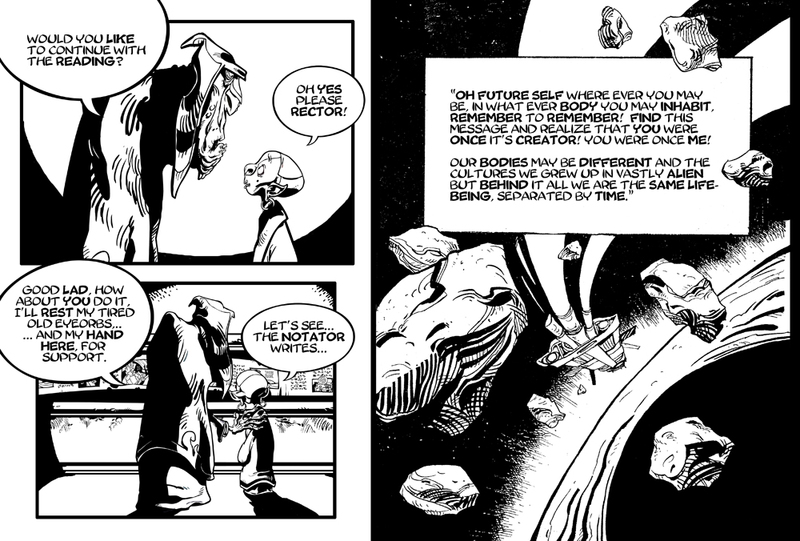 The animation shows the Sacred Text scrolling in the background and the comic is the Sacred Text! I had to turn the old illustrations from 1983 into a Holy Stripture, within less than a week due to the printing schedule! Below is the introductory page. I had trouble incorporating it into the story until woke up one morning realizing that the artist portrayed in the image is the Notator:- the zoon who wrote the Stripture! I've always loved this image which at the time summed up my personal feelings about being an artist. It was a bold experiment before I found my "Zooniverse" style. I was choosing a direction here, the pig drawing was an old comfortable look that I'd used for my earlier "TimeTree" comic. The spooks were an entirely new style of mine that has never been published and the "Notator" character was halfway between my previous Asphyxiation work and the emerging Zooniverse technique. Again, the original art was never returned from the printer, and presumed stolen, so I scanned and restored the image from the printed cover. "Sacred Stripture" includes new art that I took from the "History" animated loop, I also made new panels with assets created in Flash (below left). The Rector and his innocent Supplelicant are recent artwork, the rest (below right) was originally done in 1983 when I was twenty years old for two publications in England. 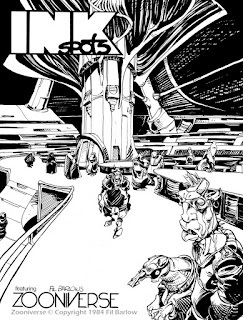 These random images were pre-Zooniverse and gave me a chance to experiment with inking styles while creating strange environments over which the publisher pasted badly photocopied code for the Spectrum (an early home computer that was released in the UK). 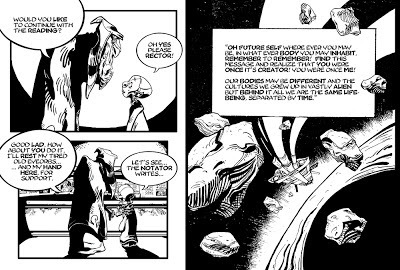 Old and new art combined in "Sacred Stripture" the second Zoonimini story. 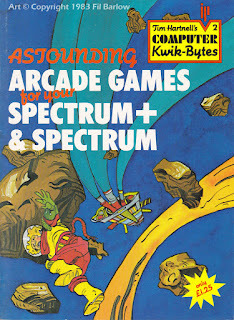 Below is the second book of "Astounding Arcade Games" which was published exclusively in England in 1984. I had finished the art a year before for issue #1 and the publisher reused my art without my permission for the second book, this time cutting images up to make it look like new work. The cover below is a mash up of two pieces of art, and no I didn't color it. I once possessed a mint copy of the first book but it's long gone now so I can't verify it's exact name. I now have the original illustrations in my care and used most of them for the Sacred Stripture. I scanned them shuffling them around until some semblance of a theme came into view. I now have a Zooniverse based Holy Scripture to form religions and philosophies off with Zoons misinterpreting and misquoting the texts. This is going to be fun! Congrats on the success at Armageddon! Please let me know when your store is open. I will definitely pick up some books! We will announce it here, we are just setting up Paypal on the site. Wow, the art is really inspiring. Let me know where to point my money cannon! Wonderful! And wonderFIL! Looking forward to seeing what you've been up to; comics old and new!